This next generation Heart Rate Monitor brings increased heart rate accuracy through integration of accelerometer data and advanced signal processing to bring “No Chest Strap” technology to all serious exercisers and to those who just need a simple, accurate and convenient heart rate monitor. Requires no programming to immediately display heart rate With a simple input of personal data, the ePulse2 will also calculate calories burned and target exercise zones, including In-Zone alerts that can be customized by the user. Internal rechargeable 3v button cell battery provides sustained performance under all exercise conditions and, for longer battery life, there is an“on demand”power saver feature for extended uses such as hiking. Personal Body Fat Tester: enjoy the ability to measure body fat easily by yourself, in the privacy of your own home, with the reliability and accuracy that is expected of todays registered medical devices. brings increased heart rate accuracy through integration of accelerometer data and advanced signal processing to bring “No Chest Strap” technology to all serious exercisers and to those who just need a simple, accurate and convenient heart rate monitor. With a simple input of personal data, the ePulse2 will also calculate calories burned and target exercise zones, including In-Zone alerts that can be customized by the user. graphical display is a technology leading innovation in fitness products. provides sustained performance under all exercise conditions and, for longer battery life, there is an“on demand”power saver feature for extended uses such as hiking. power saver feature for extended uses such as hiking. Stopwatch feature with split times for runners and cyclists. New, low profile design permits Convenient and comfortable easy viewing. ePulse2 works equally well for both men and women and addresses the issue other heart rate monitors struggle to overcome…no chest strap needed! Personal Body Fat Tester enjoy the ability to measure body fat easily by yourself, in the privacy of your own home, with the reliability and accuracy that is expected of todays registered medical devices. 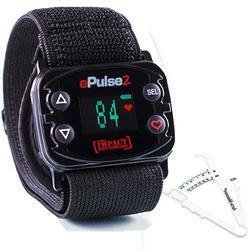 Check Your Heart Rate Instantly with NO chest strap. Automatic Calorie Counter – Tracks your “burn” rate. Customize Your “Target Heart Rate” Zones” – Makes sure you are exercising efficiently. Stopwatch with Split Times Monitor your run or workout in detail. Full Color “Graphical” OLED Display - Read your heart rate easily in sunlight or at night. Personal Body Fat Tester - This kit comes with Personal Body Fat Tester to measure body fat easily by yourself.